One of NASA's two briefcase-size MarCO spacecraft captured this image of Mars on Oct. 2, 2018 — the first-ever photo of the Red Planet by a cubesat. A tiny Mars-approaching spacecraft has snapped a photo of its target, marking the first time that a cubesat has ever captured an image of the Red Planet. One of NASA's two briefcase-size Mars Cube One (MarCO) cubesats acquired the image on Oct. 2, when it was about 8 million miles (12.8 million kilometers) from the Red Planet, agency officials said. "We've been waiting six months to get to Mars," MarCO mission manager Cody Colley, of NASA's Jet Propulsion Laboratory in Pasadena, California, said in a statement. "The cruise phase of the mission is always difficult, so you take all the small wins when they come. Finally seeing the planet is definitely a big win for the team." Annotated version of the MarCO Mars photo of Oct. 2, 2018, identifying the various spacecraft parts visible in the image. 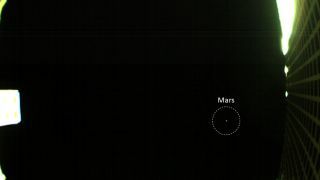 MarCO-B (Wall-E) took the newly released image to test the exposure settings of a wide-angle camera, NASA officials added in the same statement. The MarCO duo will attempt to relay home to Earth data from InSight during the lander's Mars-touchdown attempt, which will take place on Nov. 26. But this is not a crucial duty; other NASA spacecraft, such as the Mars Reconnaissance Orbiter, will do this work as well. Eve and Wall-E won't attempt touchdowns of their own; rather, they'll fly by Mars on Nov. 26. Their mission will then come to an end, after engineers analyze and asssess data about the cubesats' health and performance. InSight's name is short for "Interior Exploration using Seismic Investigations, Geodesy and Heat Transport." The lander will measure subsurface heat flow and monitor "marsquakes," gathering data that will reveal a great deal about the Red Planet's interior structure and composition. This information, in turn, should shed light on the formation and evolution of rocky planets in general, mission team members have said.